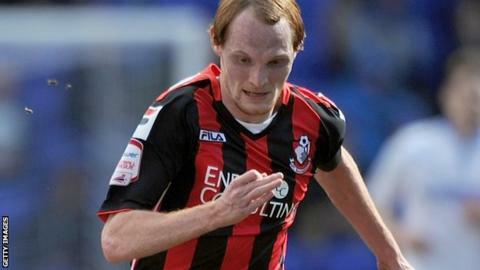 Bournemouth midfielder Shaun MacDonald has signed a new three-and-a-half year contract with the League One club. MacDonald, 24, joined the Cherries in August 2011 from Swansea after various spells on loan at Yeovil. He began his career at the Swans but left after six years to move to the south-coast and has played 46 times for the Cherries. MacDonald, who was injured in December, has signed until 2016 but is currently sidelined with an ankle injury. "The club is going in right direction, and the gaffer and Jason (Tindall) coming back had an impact on me wanting to stay because they have been doing a great job," MacDonald told the club website. "Obviously with the injury it has not been great but hopefully I'll soon be back, and I don't think I could have signed at a better time - hopefully we can go on another good unbeaten run. "It is the perfect club for me at the minute - we play the right way and we are definitely going in the right direction with the way we have been putting performances in. "For me it was a no brainer - I am happy to stay, because the club matches the ambition of me as a player."